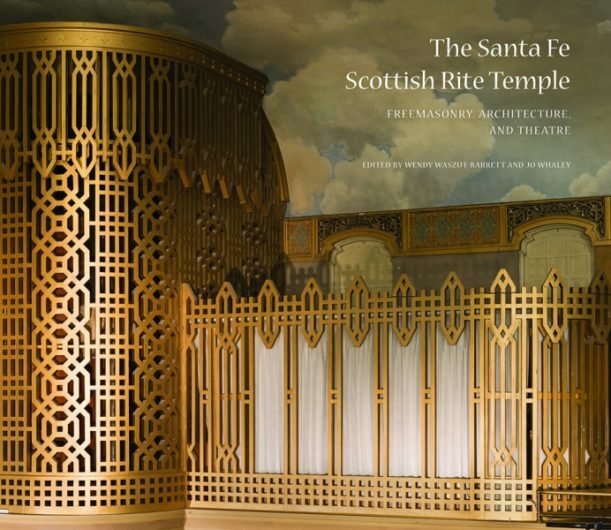 The newly-released book, The Santa Fe Scottish Rite Temple: Freemasonry, Architecture, and Theatre, from the Museum of New Mexico Press is available for sale from the Santa Fe Scottish Rite Temple. This book is a comprehensive treatment of the history of Freemasonry in New Mexico, the influence of Orientalism on the art and architecture of Santa Fe, and the origin and meaning of the theatrical stage scenes and costumes by authors Rick Hendricks, Khristaan Villela, Wendy Waszut-Barrett, and Jo Whaley. When you purchase your copy of The Santa Fe Scottish Rite Temple: Freemasonry, Architecture, and Theatre from the Santa Fe Scottish Rite Temple, the proceeds from your purchase fund our Temple Historical Preservation Foundation, a 501(c)3 foundation, which keeps the Scottish Rite Temple open as a premier performing arts center and time-honored landmark in Santa Fe. To purchase your copy of The Santa Fe Scottish Rite Temple: Freemasonry, Architecture, and Theatre from the Santa Fe Scottish Rite Temple, please select the option below and click on the “Add to Cart” option where you will be directed to PayPal for quantity options and payment.